Happy Labor Day weekend! I hope you are all enjoying a day off from work as we unofficially say goodbye to summer. In keeping with last week’s theme, I am still trying to get through the abundance that is my summer garden harvest. This was the first year I have a dedicated bed just for herbs, and I went a bit crazy at the nursery. I had so much room that I wanted to plant everything! One new herb I tried is called lemon verbena. The plant grows like a small shrub, with leaves that release a sweet lemon/citrus flavor when touched. It seemed like a great way to get citrus notes in dishes without adding any acid. But I planted it without any idea of how I would actually use it. And so, of course, it flourished in the garden and started growing over the other herbs! I needed to harvest and use some quickly. My book club recently read a book where the characters mentioned buying fresh lemon verbena and making frozen custard with it. Although there was no recipe in the book, it gave me an idea. Every year, I make fresh mint ice cream following the recipe in my David Lebovitz book, The Perfect Scoop. (If you have any interest in ice cream making, his book is absolutely essential.) 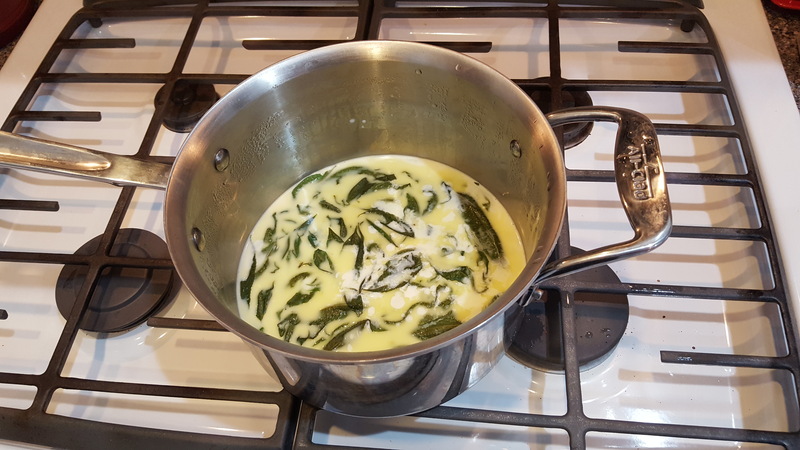 It calls for infusing the custard base with mint leaves, then straining them out. I figured lemon verbena leaves would work the same as mint leaves, and I was right! I used slightly less lemon verbena leaves though, as I think they are more powerful than mint. I also added lemon extract, to give it a more dimensional lemon flavor. This ice cream is a refreshing treat for a hot summer evening. It’s got a mellow citrus flavor, not tart like a lemon sorbet. It’s particularly good with hot fudge or fresh strawberry sauce topping it! Alcohol is the “secret” ingredient in all my homemade ice creams (not so secret because I tell anyone who asks, and I’m writing it here). Alcohol helps ensure great ice cream texture because it prevents the custard from freezing too hard. That’s because pure alcohol does not freeze anywhere near the temperature of a home freezer. A small amount of a distilled liquor (around 40% alcohol or 80 proof) is your insurance policy for a smooth, creamy ice cream. Vodka is always an option as it is mostly flavorless, but you can also up the intensity of the ice cream with a complimentary flavored alcohol (in this case, limoncello). Of course, adding alcohol is optional if you don’t drink, but I never skip it! Just don’t go overboard. Never add more than 3 tablespoons or your mixture may not freeze properly. In a medium sauce pan, warm the milk, 1 cup of the heavy in cream, sugar, and salt until sugar and salt dissolve and mixture is hot. Add the lemon verbena leaves and stir to cover in liquid. Cover pot, remove from the heat, and let steep for 1 hour. Pour the infused mixture through a fine mesh strainer into a large bowl. Press on the leaves to remove as much of the mixture as possible, then discard the leaves. Pour the infused mixture back into the same medium sauce pan. Pour the remaining cream into the same large bowl. Put the mesh strainer on top. Have a slightly larger bowl filled with an ice bath ready nearby. Put the sauce pan over medium heat to rewarm the infused mixture. Place your egg yolks in a small glass bowl or measuring cup. Slowly ladle some of the warm infused mixture over the egg yolks, whisking the yolks constantly (this tempers the eggs). Scrape the warmed egg yolks into the sauce pan and whisk to combine. Using a heatproof rubber spatula, stir the mixture constantly, scrapping the bottom of the pot as you stir. 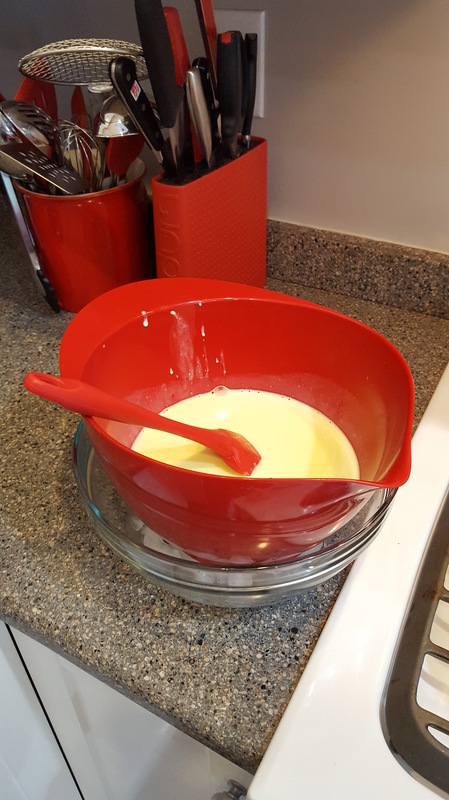 The custard is done when the mixture has thickened and coats the spatula, leaving a clear trail when you drag your finger through it. If you have an instant read thermometer, the temp should be around 175 degrees (do not get above 185 degrees). Immediately pour the custard through the mesh strainer into the large bowl with the cold cream. Stir over the ice bath until the custard cools to room temperature, then add the extract and alcohol (if using). Transfer to a container with a lid to chill thoroughly in the fridge, at least 6 hours, or overnight. Freeze and churn in your ice cream maker following the manufacturers instructions. 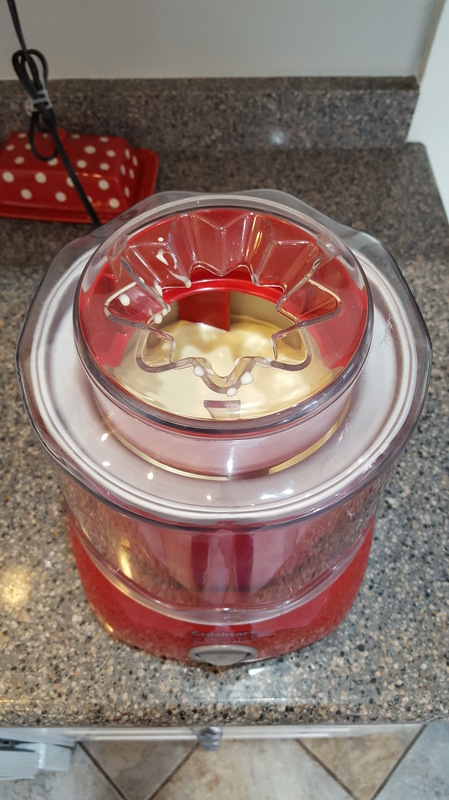 If your unit has a canister that needs to be frozen, make sure it is frozen well in advance of churning; 24 hours in the freezer is usually necessary for best results.